Our 70' backyard obstacle course is loaded with 9 different obstacles to navigate through, including a 6' obstacle tunnel. The tunnel passes right through the center of the slide to the other side. There you will find 3 more challenging obstacles to go through before you enter the ladder climb which leads you to the top of our 16' slide. From the top of the slide, you're guaranteed a thrilling ride down to the bottom. Even 13 year olds will get a rush from our 50 degree sliding angle. 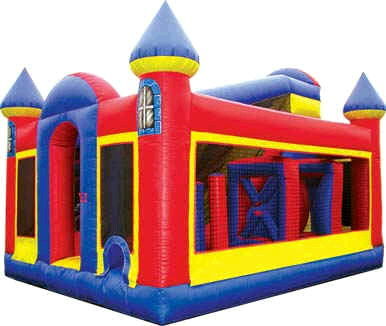 * Please call us for any questions on our inflatable obstacle course 70 foot rentals in Cornelius NC, Lake Norman, Mooresville, & Davidson, North Carolina.